Like the ho ly trinity of Hindu mythology and theology, Brahma, Vishnu and Shiva. I draw an analogy of the three canteens in and around the Journalists precinct the canteens at INS (Indian Newspaper Society), UNI (United New s of india) and PTI (Press Trust of India). I know I have not been in the content side (in Television) and on the edit side of a newsroom (in print), but I have the gumption to not only write, but write about the journalist hangout joints, that is really the fall of the last bastion. Like I have often said to some eminent friends on the other side of the Chinese wall (there is supposed to be an imaginary and metaphoric wall between the business side guys also termed as the suits and the content guys, the intelligentsia), that I can learn to write, the point is can you learn to sell. Well let us leave that for the moment and cut to the chase of the eating options at these legendary canteens. These are the canteens where many a time the agenda of the nation has been decided, these are the haloed portals when many a battle of words has been debated. Socialism, Communism, Capitalism, Extreme Right wing, Left, Centre, Further Right have been discussed over many tortured sessions of vadas and coffee. I have often wanted to do this story. Finally two winter mornings and an evening and I had my research sort of, complete. Got talking with th e proprietor of Sri Krishna caterers at the INS, he has had the contract for over 4 years and is a break away or splinter group from the caterers at Andhra Bhawan. They cater for many a function and offices. We had a hot and a quick standing breakfast . My partner in crime Shantanu, yours truly and Robert, a colleague visiting from Bombay. 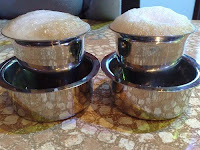 We order soft and succulent idlis (2 plates), hot and steaming Upma (2 plates) and a plate of Vada and perhaps a coffee each . The Idlis and Upma were nice the vada was forgettable and all we paid was Rs 80/- . Now that is new benchmark breakfast for three at Rs 80/-. Can you beat that. Well below the Rs 100 mark and that too for three. Lo behold ! No wonder, Content is King. They get to eat so cheap. 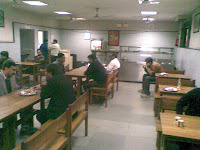 INS building has been around since 1956, I guess , there has been a canteen here since, feeding many a million. Shantanu and I liked the experience, perhaps Robert did too as he went in for seconds or he was plain hungry. A truly heavy weight in terms of a canteen, has been around since 1961, earlier the south Indian Swamis ran it. Even my father, often brought home the South Indian Namkeen packets which were hugely popular in the early 80s they are still available today on a cold January morning in 2010. Unfortunately there have been many a changed management. Rahul Verma an eminent food writer of The Hindu, is the only one who has written about the legendary canteen which has nourished and nurtured again, many millions. And you, know I am one of the suits and get to write a tribute to the scribe kind of places and that feels like a double whammy. Our experience was quick and hurried the idea was to see the place, is it still there and what is it like ? Yes it is there at the same place since then . 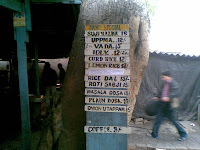 We had a upma a plate of vada and two coffees at a handsome amount of Rs 37/-. The vadas were really nice and fresh out and piping hot. The upma was a little flat. Well what do we expect from a Himachali now running the place. 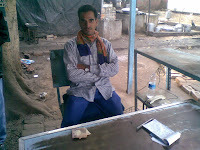 In fact I got to chat with Sant Lal Sharma, the owner who also proudly posed for me. An outdoor dining with a shed for a kitchen. The quantities being cooked were enormous. Long live UNI, as we like the canteen. This again has been the raising ground for many an illustrious and talented journalist and television content creators I know of Pankaj Saxena, Anil Padmanabhan and I am sure lots more. I had to go to the Canteen. Bhushan, our trusted driver took me their one winter evening this January. The building is posh, atleast better than I thought it would be. Though, the can teen or the cafeteria in this case was a gloomy tube lit affair. 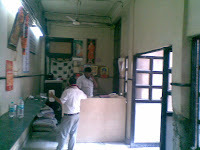 It is run by a Joshi Ji, who has been running it for more than half a decade. He was happy to rattle out the menu for breakfast, lunch and beyond. It was 5 pm, decided to check out nearly everything on offer then. 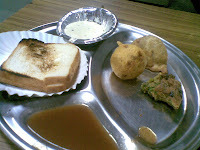 Here goes, 3 samosas, bread and butter, 1 aloo bonda and a pakora, followed by a, made in Kashmir, Lichi drink all for Rs50. The experience was just about normal to average. Maybe there is a better time to be there, probably lunch. It was a little better organized in terms of seating and other stuff. This kind of completes my tour of the Holy Trinity In and around Rafi Marg. Well all were priced at Rs 100/- and therefore qualify for my eating out under Hundred Rupees qualifying benchmark. Hey Samil, came onto your blog after ages. Wondered what kept me away for so long:) Great stuff. 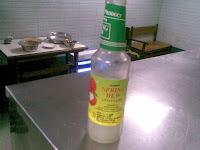 Your PTI canteen post bbrought up memories of the time when I had visited my aunt when she used to work in ABP Delhi in 92. They were at PTI bdg then. And, yes, she used to be a suit. Never went to the canteen. But they used to order food from there. I had just taken my twelfth and come during the summer break. Was quite the baby there and was treated by all her colleagues. agree ... the grace of Trinity!